The tragic loss of their unborn child has devastated Kate (Vera Farmiga) and John (Peter Sarsgaard), taking a toll on both their marriage and Kate’s fragile psyche as she is plagued by nightmares and haunted by demons from her past. Struggling to regain some semblance of normalcy in their lives, the couple decides to adopt another child. 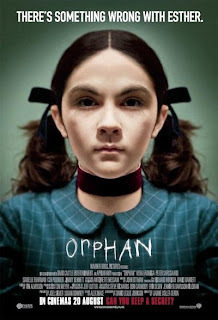 At the local orphanage, both John and Kate find themselves strangely drawn to a young girl named Esther (Isabelle Fuhrman)…but Esther is not what she appears to be and, concerned for the safety of her family, Kate tries to get John and others to see past Esther’s sweet facade. But her warnings go unheeded until it may be too late…for everyone. There are 200 tickets up for grabs in this exclusive Premiere Screening and we’re giving a pair of invites to each Nuffnanger who leaves a comment telling us what is the scariest thing you did/wished you’ve have done to frighten your parents. Ok for Nuffnang Glitterati bloggers log on on nuffnang website and write a comment about this Movie.